Apimab Laboratoires, creator of the Propolia® brand has seen its staff increase along with its growth and brand recognition. 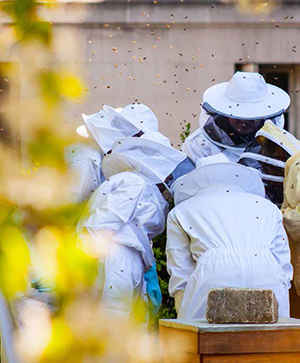 The company now has about 30 employees who are all involved with bees and convinced of the value of Propolis in our areas of activity. A belief most certainly inspired by Mr Bernard. The Propolia® team works on new formulas every day. It takes its inspiration from Nature to improve our current products, based on our personal experiences and..., particularly, your needs.. It's obvious to us that our quality must both respect biodiversity and meet your everyday needs! From the harvesting beekeeper to the finished product in your bathroom, Propolia® products pass through different departments, each of which is specialised in its particular field and works together with the others to ensure that you will be entirely satisfied with our little Propolia® beehive. Management orchestrates the interactions between all the groups and maintains the buzz...the beehive-like atmosphere.